The western Himalayan region of Ladakh (state of Jammu and Kashmir) is the northernmost region of India. Bordered by Pakistan in the west (province of Gilgit-Baltistan) and China in the north and east (respectively by the autonomous regions of Xinjiang and Tibet), Ladakh presents an ideal geographical location to study the cultural interactions between the Indian subcontinent and Central Asia (we include the Tibetan plateau in the latter). The four-year plan for 2013- 2016 focuses on the valley of Nubra (3000 m asl in average), the northernmost extension of Ladakh. The role of the Nubra as a gateway between northern India and Central Asia in modern times is well known. From the 17th century to the middle of the 20th century, the Nubra was the main road for trans-Karakoram trade between Leh and Yarkand (Tarim basin, actual Chinese region of Xinjiang). Except for Buddhist texts of the 15th century, the most ancient written source mentioning the Nubra dates from the middle of the 16th century, when the area was invaded by a Turco-Mongol general from Yarkand. Together with long distance trade, this invasion testifies that that the rugged and the high Saser and Karakoram passes (5334 and 5578m asl) are not a barrier between Ladakh and eastern Central Asia. A preliminary survey by the ASI in 1992 and three extensive campaigns of surveys (in between 2006 and 2011) by L. Bruneau and M. Vernier revealed a wide variety of remains, both from a chronological and typological viewpoint, on a limited area (30km from north to south). The four-year research project aims at apprehending the links between the north-west of the Indian subcontinent and Central Asia overtime in establishing a chrono-cultural sequence of the Nubra, from Neolithic to Medieval period. The field campaigns of MAFIL last one month, every year (usually in September). The team is formed by a dozen of French, Indian and Ladakhi members that are archaeologists, engineers or students. 2013 campaign resulted in the consolidation of the cultural sequence of the sites selected for the project. It is noteworthy that the sites of Murgi, Tirisa and Deskit revealed long termed occupation. 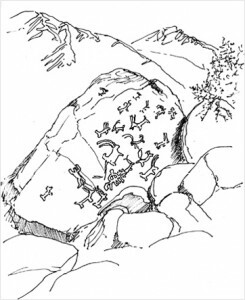 Rock art surveyed prior to the 2013 mission documented human presence during the proto-historical period. Further archaeological and geophysical exploration of the sites and their surroundings in 2013 testified to human occupation during both the pre-historical and historical periods. Among the discoveries made during 2013 campaign, the lithic site of Tirisa is without doubt the most remarkable. This site is, to date, the only serious testimony of pre-historic human presence and occupation (most likely transitory) in the region at an altitude of 3000 meters. This imposing open-air site would have offered appropriate shelter owing to its geomorphic configuration (depression sheltering a lake), and the presence of andesite that served to manufacture stone tools probably explains why prehistoric human populations selected the site. The study of pottery is another of the MAFIL’s major achievements. During the campaigns of 2013 and 2014 more than a thousand representative sherds, collected over 28 sites, were studied. The technological analysis, together with a preliminary typology, will be published in form of a catalogue. An intra- and cross-regional study will be included in the latter as well the petrographic analysis of a hundred of sherds. Hopefully this study will be used as a reference for further study of the pottery of Ladakh and Western Himalayas. In 2014 the study of surface material from Deskit enabled the MAFIL to propose a chronological sequence for the site: first a protohistorical occupation characterized by rock art and burials, then a post-Kushan occupation (4th-8th centuries) followed by a late historical occupation (14th-15th centuries). The localization of the burials, their typology (as visible on the surface) and their close proximity to petrogyphs engraved in the ‘animal style’ point to Iron Age steppic cultures. The identification of sherds presenting techno-typological similarities with pottery excavated at Barikot (Swat, Pakistan) and in eastern Bactria dated in between the end of the Kushan period and the end of Middle Ages, that is to say in between the 4th and 8th centuries AD enable us, for the first time, to assign a first millennium date to an archaeological site in Ladakh. Such a chronology was confirmed by C14 datings obtained in 2015 on two wooden samples taken during 2014 campaign on the ruined stūpa of Tirisa (calibrated dates: 425-579 and 695-937 AD). The results have a historical impact that goes well beyond the historical and religious context of the Nubra itself. The datings of the Tirisa stūpa are the first (and to this day unique) absolute dating ever obtained for a Buddhist monument in Ladakh. For the first time, we can confirm irrefutably that Buddhism was present in Ladakh well before the beginning of the second millennium AD. For its third campaign the MAFIL focused on the Buddhist site of Choskor, located north of Leh oasis, just below the pass leading to Nubra. Ruined temples and stūpas indicated that Choskor was an important religious compound at the turn of the second millennium. This site is quite unique for Ladakh since among Buddhist monuments traces of settlements, irrigation works, terraces and possible burials are visible. About 140 structures were documented and mapped in 2015. Pottery was systematically collected at the site to enable a future study and a trial pit was opened in one of the ruined temples, exposing pieces of painted clay sculpture. During MAFIL’s 2016 campaign extensive excavations were led at the site of Choskor. Three locations were excavated. Excavations in the main ruined temple, built in mud brick, revealed numerous fragments of painted clay scupltures, mural paintings and votive objects (in clay, metal, stone and pottery). The remains exposed (pillar bases, central platform) enabled to better understang the architecture of the temple. Taken together and compared with other Western Himalayan temples, these elements enable to propose a late 10th century-early 11th century date for the temple of Leh Choskor. Several samples have been submitted for dating. Excavations on a dry stone building revealed monumental elements (wide walls and large entrance) that questioned its possible housing function. Finally, excavations on a buried, looted, stone structure did not enable to identify its function (funerary, storage or hiding space). At the present stage of research it is not possible to state whether all structures at Choskor are contemporary or if the site was occupied during sucessive periods. Consequently, another four-year project (2017-2020) will be fully dedicated to the site of Choskor that has great potential for future researches.